Terrifying Leadership: Because I have terrified my minions into obedience, they will not break while I am still alive no matter how dire the situation gets. Caveigator (-3): Because I have raised a caveigator since it hatched I am accompanied by a loyal caveigator pet. Magical Mace (-2): Because I have a mildly magical weapon, I gain +1 when Combative to attack and defend while wielding it. Tough Hide: Because I have a tough hide I reduce by one (1) all stress inflicted on me as damage by physical attacks, and when I defend against physical attacks and tie my opponent does not get a boost. Uggilo is the last remaining authority figure among the troglodyte tribe of Lady's Light, Uggilo dwells in a cave used as a shrine to Zevgavizeb. Uggilo has spent his recent days praying fervently for Zevgavizeb's intervention against the boggards, periodically offering up a sick troglodyte as a sacrifice. Uggilo is greatly feared by the other troglodytes, who believe him to be the immortal son of their demonic god...for how else could Uggilo have outlived the other champions of the tribe and even the chieftain? 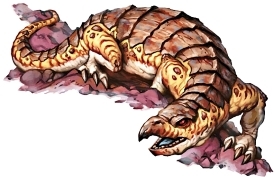 Uggilo's closest companion is an enormous caveigator he raised from a hatchling. The caveigator is nameless but loyal, and is never far from Uggilo's side. Uggilo has a jade (un)holy symbol of Zevgavizeb (a coiled clawed tentacle). He also has a small sack filled with pearls (a dozen in all, each worth at least 100 gp); where he got them might forever remain a mystery...perhaps from a shipwreck. However, his prize possession is a crude but magical mace that is a tribal treasure passed down to Uggilo when the previous tribal priest died.